Razia is a well-known commentator on African markets, advising the Bank’s clients on Africa strategy and providing regular updates to African central banks, finance ministries and multilateral institutions. She joined the Bank in 1997. 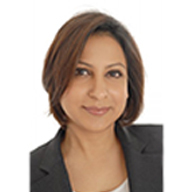 Razia holds a BSc (Hons) degree in economics and an MSc (Econ) in development, including monetary economics and international trade law, from the London School of Economics. Razia has been a member of the World Economic Forum’s Global Agenda Councils on Population and on Poverty and Development. She serves on the Advisory Board of the Royal Africa Society. Razia has been a BeyondBorders author since August 2013.